Connecting rings are among the most popular goods of jewelers. 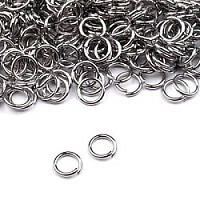 Their use is diverse, can be used to connect two jewel pieces, various decorations for necklaces and so on.The thickness is approximately 0.7 mm, we don't recommend to subject them to high loads. Specification: jewellery metal with galvanization.